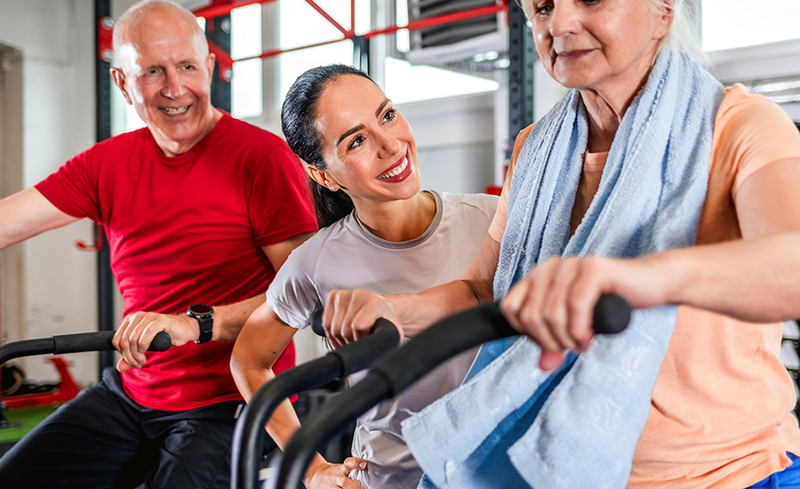 If you're interested in developing safe and effective exercise programs for older adults, the Personal Training and Group Exercise Training for Older Adults Online Program is for you! The certificate program incorporates standards from the International Curriculum Guidelines for Preparing Physical Activity Instructors of Older Adults, in collaboration with and endorsed by the World Health Organization. The American College of Sports Medicine’s Professional Education Committee certifies that Educational Fitness Solutions, Inc, who works with us to bring you this program, meets the criteria for official ACSM Approved Provider status. Providership # 672784. This program is approved for 50 Continuing Education Credits through ACSM. The Personal Training and Group Exercise Training for Older Adults Program is suited for people who are interested in a career working with seniors and older adults in the health and fitness industry, for established fitness professionals who want advanced education in working with older adults, and for allied health and medical professionals from all fields who want to design specialized exercise and wellness programs for their older adult clients and patients. And if you're an exercise enthusiast over 50 yourself, this program will help you develop a personalized program to meet your own goals. You can also choose to participate in an Optional Field Internship Program to get practical experience in the profession. Internships are six weeks, 60 hours long. Graduating students will be prepared for a career working with older adults at senior centers, medically based fitness facilities, retirement communities, YMCAs, JCCs, hospitals, community wellness programs, personal training studios, physical therapy clinics, long-term care facilities, corporate fitness centers, collegiate settings, and private and commercial health clubs. The program is offered in partnership with the International Council on Active Aging (ICAA), the American Senior Fitness Association (SFA), the Aquatic Exercise Association (AEA), and Healthways SilverSneakers® Fitness Program. Certificate program graduates will receive a complimentary one-year membership to the ICAA, which includes registration discounts for the annual International Active Aging Conference. In addition, graduating students will receive preferred discounts for the SFA's certification exams (Senior Personal Trainer Certification or the Senior Fitness Instructor Certification), the AEA's certification exam (Aquatic Exercise Association Fitness Professional Certification), and for Healthways Instructor Accreditation for Older Adult Exercise. This program can be taken from a PC. It is not recommended for MAC users. It is compatible with the Windows XP and later operating systems and IE 7 and later browsers. Technical requirements include, but are not limited to, having Internet access with a 56K modem (but it's highly recommended that you have DSL or high-speed cable Internet access), 64 MB system RAM, 200 MB free hard-disk space memory or sufficient storage, reliable e-mail account access, and a reliable Internet provider. Some individual programs may have additional software or hardware requirements. There are no specific prerequisites to enter this program, other than an Internet connection, an e-mail address, and basic computer knowledge. Students do need to receive CPR certification and approval by the program coordinator prior to beginning the Optional Field Internship Program. This program is for you if you're interested in developing safe and effective exercise programs for older adults or training your staff to do so, and if you want to manage and market new programs to older adults. This program is also suitable for companies that require the certificate program as a professional development program for employees . And this program is definitely for you if you're a senior or older adult exercise enthusiast who wants to learn more about exercise program design, health, and wellness. Natalie Johnson, MS, has worked in an academic setting throughout her career. Natalie taught for the Kinesiology Department at San Diego State University in addition to being the Fitness & Operations Director at the Aztec Recreation Center. While instructing for the Kinesiology Department, she also was a “Student Mentor”. As a mentor Natalie advised senior Kinesiology students on resume writing, interviewing skills and assisted students in finding the most appropriate job based on experience, education and location. Natalie’s experience outside of academia includes working in world renown resorts in California, Mexico and Jamaica (The Golden Door & Rancho La Puerta) in addition to being the owner of a fitness company called “Fit Chicks” since 2001. Natalie is certified as a Personal Fitness Trainer, Group Fitness Instructor, Sports Nutritionist, Wellness Coach and Pre/Post Natal Specialist. She presents annually for the Medical Fitness Association, Athletic Business and the National Health Benefits Conference. Natalie was a Body by Jake Master Trainer and presenter on FitTV and continues to promote fitness locally in Tampa, Florida and nationally in publications and television. Natalie is currently the “Manager of Health & Lifestyle Programs” for a Medical Health Plan in Florida. She oversees the Fitness Center and its staff as well as all preventative programs relating to weight loss, fitness, exercise and nutrition. She works closely with a medical management team and is very active in promoting exercise as medicine and prevention. Natalie is also the Regional Director for the Medical Fitness Association and works closely with the organization to integrate fitness into the medical community. 12. How am I graded or assessed in the programs/program? Your grade will be determined based upon the total points earned on quizzes, problem-solving questions, exams, written reports, special projects, and assignments. 13. What must I do to graduate with the Certificate in Personal Training and Group Exercise Training for Older Adults? Complete and receive a passing grade (of C- or above) in all programs. 14. How will I interact with the teacher? We know how important it is for the teacher to be available to the student. You can use regular e-mail, the classroom discussion boards, the chat room, or the telephone to interact with the teacher. The instructor for my certificate program, Natlie Johnson, was excellent. She was helpful, answered my questions right away, graded my assignments in a timely manner, provided great feedback, etc. My career counelor at Gatlin, was also very helpful when I needed him. I truly enjoyed the course content and learning about physical activity for older adults. I found the written projects for each course to be enjoyable. I liked that they covered a wider variety of topics.